Wow. I gained quite a bit of weight during those seven months of struggle. Cue: Time to get down on myself. Time to beat myself up. Time to question God’s plan. Time to cope by eating more. Time to reprimand myself for sinning. Time to cower before God’s punishment. Only… this time that didn’t happen. Cause ya know why? Yes, I know. New… once again. I was new a year ago when I first started the covenant, and I coasted off of that newness for 365 days. Until I decided, in my infinite wisdom, that I could be both the old me and the new me. But now, I am a “new” new. I have learned even more about God and His plans and His thinking and His ways. His ways aren’t my ways. My ways aren’t His ways. I know now that after this 21 days that there will be another 21 days and another 21 days and another. And I know now that after those 21 days, that this lifestyle of eating will continue until I transfer my residency from Earth to Heaven. Because I have realized that God wants to heal me… not for just a year, but for a lifetime. God, I want a permanent healing. Not just a year. Not just five years. I want to be fresh and “new” new forever. You see, these seven months I’ve been just holding on. Holding on to you. I’ve been depending on You, God; knowing that you are everything I need. 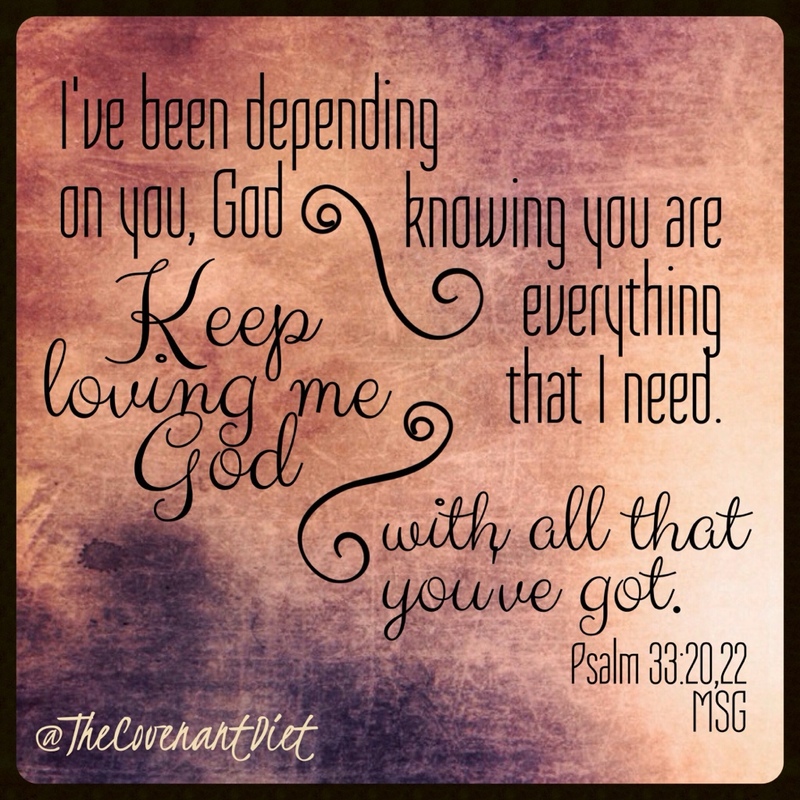 Keep loving me, God, with all you’ve got— that’s what I’ve been depending on. Psalm 33:20,22 And now I keep holding on, but I feel like now I’ve let you pull me off of the cliff and that we are, once again, walking together. Help me stay waking with You, God. Amen.